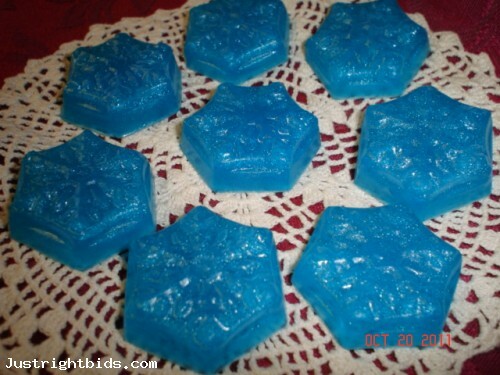 Fairy Dust (type) Scent Handmade Glycerin Soap 8 Snowflakes / Quest for Bids - Find your hidden treasure! 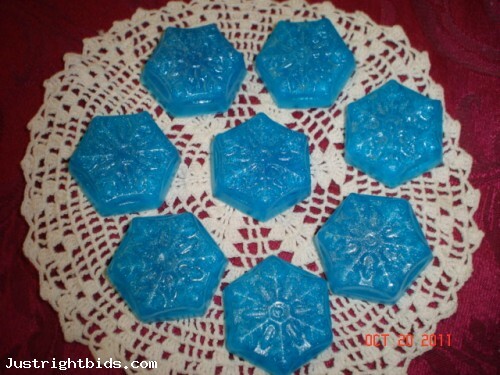 These handmade glycerin soaps are gentle and moisturizing to the skin. They are little snowflakes with blue color and mica. They have a wonderful frosty sparkle to them. They will be scented with Fairy Dust (type) fragrance. These soap will weigh approximately 3 ounces in total weight and will be bagged and labeled. This is not your exact soap, your soap will be made up fresh. As with all skin care items, should irritation occur, discontinue use immediately. Ships usps. Bath and Body items are not returnable due to the nature of the product.